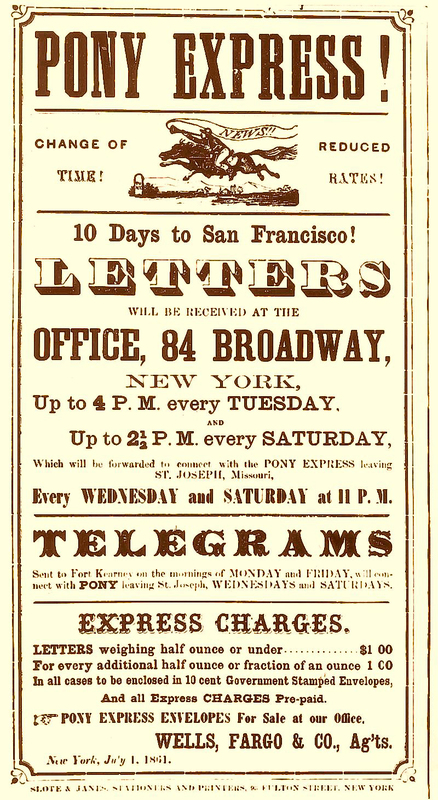 In 1860, the Pony Express moved mail between St Joseph’s, Missouri and Sacramento, California. Utilizing 200 relief horses along the route, the Pony Express delivered Lincoln’s first inaugural address from Nebraska to California in seven days and 17 hours. It was the company’s and the worldsfastest ever delivery of mail and it ushered in the era of high speed maildelivery. The horse riders who delivered the mail had a weight limit, between 100 to 125 pounds, to ensure they did not overburden the horses. One rider claimed he was 11 years old when he joined the Pony Express. The rider needed to be the size of an 11yr old, the weight limit was that strict! Unfortunately, a mere 19 months after it launched, the company owners, William H. Russell, William B. Waddell and Alexander Majors, shut down the Pony Express. The company lost ~$200k (~$5M in 2017) for the period the business existed. While the financial losses crippled the business, it was thetranscontinental telegraph that truly killed the Pony Express. After delivering 35,000 pieces of mail and traveling half a million miles, what disrupted the then-disruptive Pony Express was a new technology. A technology that looked nothing like the horses it disrupted and cost a lot cheaper than the resources required to provide the same service, deliver messages between people. It’s 2017 and Lyft, Uber, Postmates and Instacart (I’ll call them LUPIs for ease) all promise to get us something — a cab, our groceries, our restaurant orders — faster than the current technology! But their model is inherently flawed.While the Pony Express owned its horses, and still lost money, LUPIs claim all they own is technology; the horse in this analogy just so happens to be the cab driver, pickers or cyclists who are activated by LUPI technology. LUPIs are truly just brokers masquerading as convenience providers. There is no increase in revenue for the grocery store since customers maintain their regular shopping patterns. the grocery store loses the increased revenue from those unplanned purchases almost all customers make in the grocery store. Those products by the checkout line are high margin products that the grocery store wants customers to buy on a whim! The only way LUPIs can insert themselves between the customer and the asset owner, and truly benefit all parties, is by increasing the frequency of customer usage of the asset or by increasing the aggregate size of the customer base. But LUPIs are no longer increasing the size of the pie for the asset owner. This I believe is the crux of the argument between Uber’s Kalanick and Kamel.Uber has inserted itself in the money flow and takes a cut without increasing the amount of money that Kamel gets. Over time, while maintaining its commission, Uber has reduced the topline revenue for Kamel and that only negatively affects Kamel. For Uber to increase its own revenue it needs to increase the number of cabs available for customers on the road. The increase in numbers of cars on the roads, reduces the number of rides that Kamel can provide due to increased competition, consequently reducing Kamel’s revenue, but not Uber’s. The belief at the LUPIs is that, growing exponentially, through adding assets you do not own, will somehow magically increase profitability. This is a fallacy. The LUPIs are reducing the contribution of each value creating asset (a cab, a picker, a cyclist) without reducing the cost to manage that asset. This reduces the willingness of the asset to contribute.Sidenote: in business school speak LUPIs worsen the asset to sales ratio of the asset owner. To increase revenue without owning assets, from a small base of commissions, these companies and their investors believe they need to scale exponentially. The bigger you are the more pennies you can scrape off more transactions. Instacart needs new shoppers since current shoppers maintain shopping frequency despite the increased convenience. Have you personally shopped more because you have access to Instacart? Guessing your answer is ‘no’. While you might order more food from your regular restaurant when ordering online, Doordash needs new customers ordering from new restaurants to justify taking cuts of the restaurant revenue. So these companies try to grow as big as possible as quickly as possible. More cities, more states, more countries. While losing money. But bigger also comes with the need for more resources to manage the process. These companies look to Amazon. And that’s another mistake. But first, let’s consider another reason why scaling massively does not help these companies. Why Do You Think Fedex and UPS stay Niche? Fedex and UPS stay niche. own a small niche in the market that is willing to pay a premium(lawyers who will pay for overnight service, businesses that have overnight service promises etc). But owning a small niche is not what the VCs who’ve invested in the LUPIs want to hear. They want them to go big and then transfer their loss making engines to the public markets. create more value to capture more of the value in the chain. It’s why the post office is always pushing stamps (and selling it through other outlets) and always overcharging for tape and boxes. This second approach to making more money is why the LUPIs point to Amazon. But..
Amazon is the wrong analog. For a long time everyone complained about Amazon losing money. Being a broker, because that is what it truly was as it did not own most of the assets it sold, meant the company only took a small cut of product sales. The company could not increase margins without eating into the margins of sellers, the true asset owners, on its site. So it kept losing money while growing bigger. The brilliant step Amazon took was to increase the value to the asset owner.Amazon rented its own assets to the sellers, by helping them store their inventory, and could justify capturing more of the value. Sellers offloaded physical storage and logistics to Amazon and, in exchange, Amazon took (takes) more of the pie. With Amazon Web Services (a $3.5Bn business in its own right) Amazon has replicated this model to new types of asset owners, internet and app companies across the world. The LUPIs do not have this value additive parts to their models. Yet. This ‘own the resource and rent it out’ model is what Uber has tried to replicate by leasing cars to drivers, plowing money into self driving cars etc. Like Amazon, until the brokerage element of the business model becomes just one part of a full stack solution, a full stack that includes asset ownership and rental, LUPIs (and their investors) will have to contend with the loss making nature of the broker model as technology improves information flow. The constraint is not faster horses or sleeker technology. The constraint is thatthere is only so much money to be shared between all parties when you insert your app (and the back-office that supports that app) between a consumer and the product/service they want to consume. The constraint is that the broker model, even with new technology, is not value additive. At some point someone has to be purged from the system, and it won’t be the asset owner, producing or delivering the service, or the consumer, who pays for the service. Thanks to 99% Invisible for the Pony Express Story and Fola Dada of OjaExpressfor the conversation that led to this post! Please like, tweet, share and heart the article if you enjoyed reading it. Sign up for my Polymathic Monthly Newsletter here, you’ll love it. Tesla’s Astronomical Stock Price? It Has Little To Do With Cars. Blockchain and The Utility Industry aka Beauty & The Beast.